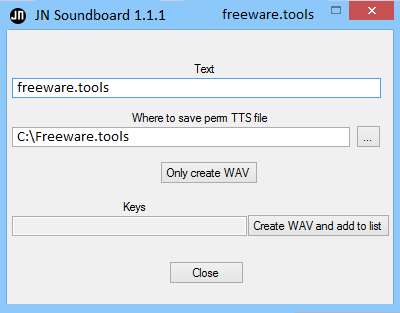 JN Soundboard uses hotkeys to play sounds into a chosen sound device. It can play MP3, WAV, WMA, and AIFF files Play sounds through any sound device (speakers, virtual audio cable) Microphone loopback (loops microphone sound through playback device) Add, edit, remove, and clear key combinations Can play a random sound out of multiple (just select multiple files when adding a hotkey) Save (and load) hotkeys to XML file hotkey to stop currently playing sound hotkeys to load XML file containing hotkeys Text-to-speech. Simply stated, you can effortlessly play audio samples and full tracks into the sound device of your choice via the desired hotkeys. JN Soundboard is a tiny utility that allows you to play various soundbites and audio clips via hotkeys and without the need to use an outside media player. The installation is as simple as it gets and entails decompressing the archive in a convenient location on your hard drive. The program comes with a minimalistic, yet uncluttered and user-friendly interface that is unlikely to give you any challenges. While in the larger left side you can preview a list of keys along with the location of the soundbites that can be played, you can add, edit, remove or clear the list by accessing the corresponding buttons on the right side. The idea behind the application is to enable you to play a preloaded selection of various audio clips with a single click. On the other hand, you should keep in mind that the utility does not include an editor that can help you cut audio samples and enhance them using various effects and filters. It is worth mentioning that the program comes with a text to speech feature and enables you to route sounds over the microphone via a virtual audio cable. You can achieve this by connecting a virtual audio cable that you set the playback device and configuring the loopback device to the jack. You should know that the application allows you to play sounds to any audio devices, provided that you can connect them to your computer. You can find the loopback as well as the playback devices from the dedicated drop-down menus in the lower section of the UI. As a side note, the program works with a handful of audio formats, namely MP3, WAV, WMA and AIFF files. If you are looking for an easy way to play amusing sounds from your favorite TV shows, games or movies seamlessly via your custom hotkeys, then perhaps JN Soundboard could lend you a hand.